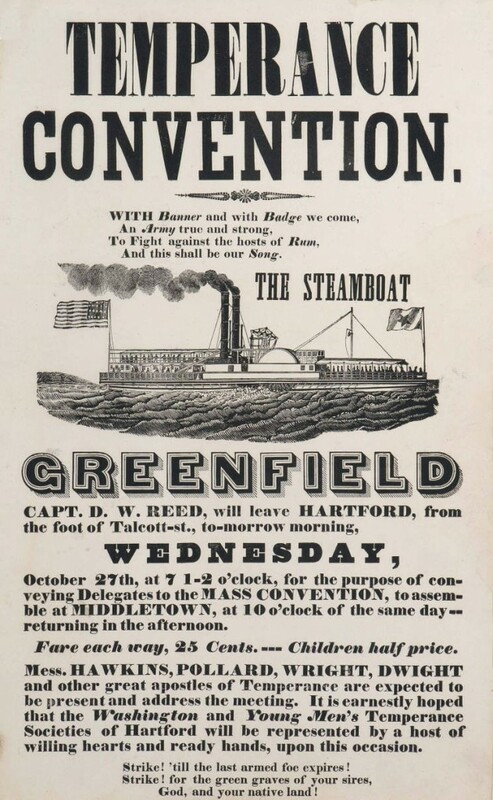 On October 27, 1841, the steamboat Greenfield traveled a short ways down the Connecticut River with the purpose of transporting people to the Temperance Convention in Middletown. The steamboat left Hartford’s Talcott Street dock at 7:30 in the morning and the fare was twenty-five cents. The two-day convention consisted of speeches and activities, and included a procession that passed through William, Broad, Washington, and Main streets in Middletown. The procession incorporated music and marchers who ranged from children to “visiting strangers” to Wesleyan faculty and students. In addition, a local bookseller sold hymnbooks so that attendees could sing “Hurrah for Bright Water” and other temperance songs. 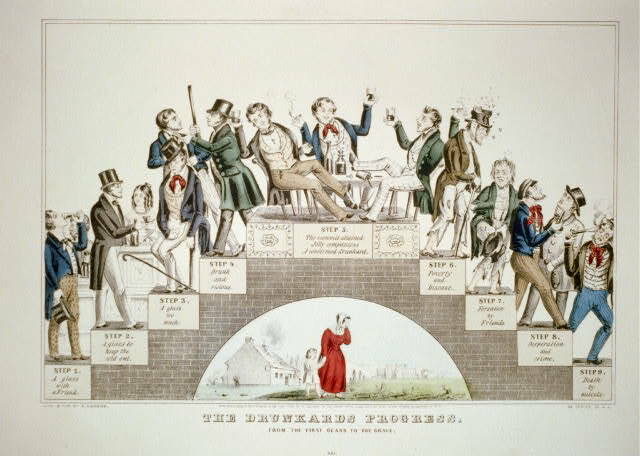 The temperance movement in the United States became a national crusade in the early nineteenth century with supporters of the movement objecting to alcohol’s destructive effects on individuals and communities. Supporters believed that the consumption of alcohol was responsible for personal and societal problems, including physical violence and unemployment. With influential crusaders like the Reverend Lyman Beecher, the father of Harriet Beecher Stowe and Henry Ward Beecher, the movement took off and by 1834 some five thousand state and local temperance societies were affiliated with the American Temperance Society. “Temperance - Newspapers of Connecticut.” Connecticut State Library Digital Collections, 2013. Link.